Craving Chocolate but Not Carbs? It’s becoming clearer over time that while chocolate is good for you – particularly that with more cocoa powder – sugar isn’t. So whether you’re diabetic or doing a low carb/keto diet, you will crave chocolate from time to time. Unfortunately, no sugar chocolate is often less chocolate and more a mish-mosh of sugar alcohols and flavors. Not good, basically. With the carbs in chocolate traditionally coming from sugar, when I found out that ChocZero was sweetened with monk fruit and fruit fiber, I was skeptical. Monk fruit can have kind of an odd aftertaste, so sweetening a sugar-free chocolate with it, though it makes sense, could be hit-or-miss. Once I’d tried it, however, I knew I needed to do a ChocZero review, as it is simply the best sugar-free chocolate I’ve ever had. The first thing I will bring up is that the servings are small, but that’s honestly fine. This particular sugar alcohol-free chocolate (Chocolate liquor) is billed as artisan-quality, and that’s not far off the mark. It’s got an incredibly rich, chocolatey flavor and if you’ve had sugar free chocolate before, you know that it’s often bland and too sweet. This proves that low carb chocolate doesn’t have to be that way, though, as it has an intense cocoa flavor and that’s really what people crave. In terms of texture, it’s pleasant, and it’s like a “normal” chocolate bar. Some low sugar chocolates are chalky, and this is mainly due to the sugar-alternatives they use, but luckily that’s not the case here. It’s the perfect low carb candy to finish a meal or sate your sweet tooth, rather than sit and just scarf down the whole bag in one sitting. This is sugar-free chocolate brought to an art form and needs to be savored. There is a bit of an aftertaste, but it’s not as strong as I expected with the monk fruit. I believe this is due to the fact they use real Madagascar vanilla beans, and the flavor really comes through. Also, since it’s sugar alcohol-free chocolate, it doesn’t have that weird, hollow sweetness that most low carb candy does. I do want to touch one more time though on the servings. They’re thin and maybe 1 inch by 1 inch. 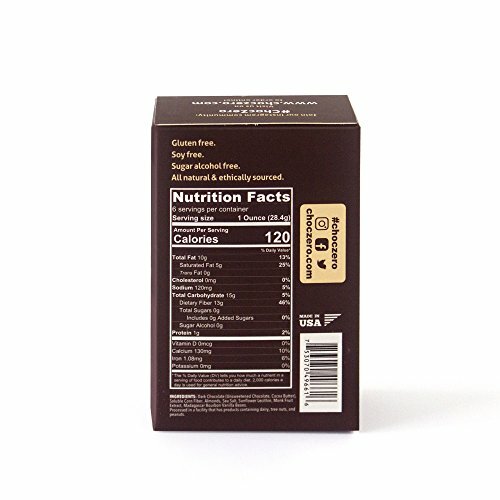 Though the price, looking at the serving size, can seem high, the flavor of this low carb chocolate really is worth experiencing. As keto candy becomes more mainstream, there will be more competitors, but for now, this is the best low sugar chocolate I’ve had. 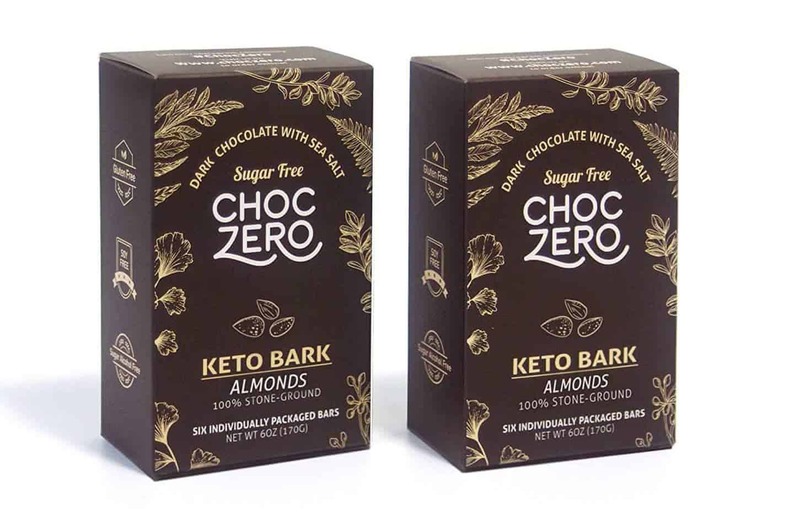 Choc Zero offers a fairly wide range of keto candy, keto chocolate, and other keto chocolate desserts. They also have ChocZero syrup, a line of sugar-free syrups that offer everything from blueberry to maple pecan. Though I haven’t tried the ChocZero syrup, the care they take with the keto candy they produce suggests the syrups would be on-point as well. The ChocZero ingredients are simple and short – no bizarre fake sugar alcohols or strange chemicals, which is wonderful. There’s also a line of keto chocolate bark, adding hazelnut, coconut, and almonds to their already divine keto chocolate bar lineup. I’m a sucker for a good chocolate bark, and these, though more calorie-dense than just the regular no sugar chocolate they sell, are honestly wonderful. Finally, the last thing they offer for keto chocolate desserts are these low carb chocolate dipping cups. Essentially creamy chocolate you can dip your favorite berries or whatever into, they’re a nice alternative to a keto chocolate bar, because sometimes you want to dip! Since there’s a lot of carbs in chocolate, but we all still crave it, it’s worth knowing that there are alternatives out there. On my search for the best sugar-free chocolate, I did run into some others worth mentioning. 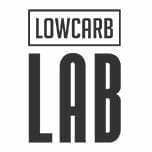 In doing a ChocZero review, I wanted to find the best lower carb chocolate available. I cannot say for sure that I have, but ChocZero has created a phenomenal product for keto dieters and diabetics alike. If you’re doing a keto diet and you’re craving delicious, real chocolate, I highly recommend giving ChocZero a try!